But last weekend’s championship game is of interest for another reason: It was not played. The fact that Westport fields 2 teams in the same age group has caused “issues” in the past. Parents in particular have sometimes been caught up in the competition between the 2 squads. Yet when it became clear that both the White and Blue teams would be playing for the championship, the coaches saw a chance to put the entire program first. Jeb Backus and Sal Latella announced that the final game would not be played. Both teams would be co-champs. 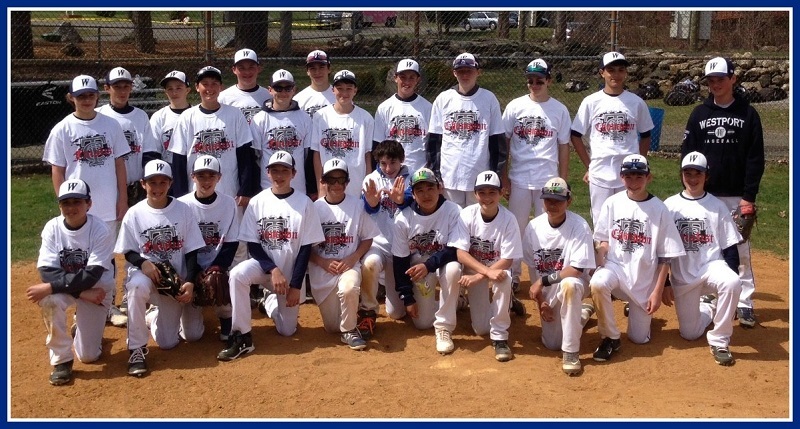 Westport’s Blue and White 13-and-Under baseball team: New Haven tournament co-champs. In years to come they’ll have plenty of opportunities to play together, for more important prizes. They’re great athletes, and “06880” will follow their progress with interest. Even if we don’t post the results of every game. *No offense to every other baseball, softball, football, lacrosse, soccer, hockey (ice and field), gymnastics, tennis, golf, swim and other parent who contacts me about every other championship, meet, match, game and practice. This entry was posted in People, Sports, Teenagers and tagged Jeb Backus, Sal Latella, Westport baseball. Bookmark the permalink. You don’t know how much this pleases my wife, Harriet — who NEVER wants to see any team lose. This way there were no losers! Even when Marc was playing soccer?! This is insane that you would support this. These are thirteen year olds, not first graders. Shame on you. Shame on the parents. And shame on anyone that would applaud your coddling point of view; this decision once again leaves our precious Westport CT 06880 children unprepared for the competitive dog eat dog world that awaits them. Trophies for everyone!